Construction Administration – IEC Integrated Engineering Consultants, Inc.
Construction Administration – IEC’s construction administration professionals work closely with our Clients to establish the total scope of the project. 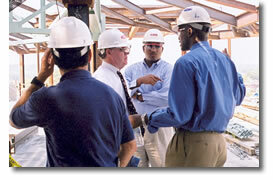 This integrated approach allows IEC to effectively coordinate all facets of the construction administration process. From cost, time and quality management through contract administration and professional practices, IEC consistently exceeds our Clients construction administration goals.